Can Chicken & Brown Rice Help Me Lose Weight? When you're trying to lose weight, a chicken-and-brown-rice meal offers a one-two punch for burning fat. You'll get the relatively low-calorie, lean protein of chicken and the filling fiber and healthy carbs from rice. Even though no single food is a magic bullet for weight loss, foods high in nutrients that aid weight loss -- such as chicken and brown rice -- help you shed weight. If plain chicken and rice can get dull, try other creative, diet-friendly ways to incorporate this power duo into your meal plans so that you won't get bored. Chicken and brown rice aren't as low-calorie as vegetables, but they fit well into a calorie-controlled diet. A roasted, skinless chicken breast served with a cup of cooked, long-grain brown rice has 358 calories -- which is about one-fifth of your daily calorie allowance on an 1,800-calorie diet -- or slightly less than one-third of your daily calorie intake, if you're on a 1,200-calorie diet. While this might seem like a lot, this serving size of chicken and brown rice -- plus a cup or two of vegetables -- will give you a filling, well-rounded meal for about 400 calories, which is appropriate for a weight-loss diet. To avoid eating too many calories, make sure you choose skinless chicken breast and use healthy cooking methods such as grilling, baking or roasting. Skin-on fried chicken breast that weighs roughly 3 ounces, contains 218 calories, compared to 142 for roasted, skinless chicken breast. If you were to switch from fried chicken to roasted chicken three nights a week, you'd save enough calories to lose 3 pounds of fat in a year -- not counting the weight you'll lose from making other lifestyle changes. A chicken-and-brown rice meal is high in fiber, thanks to the brown rice -- and this fiber can help you lose weight. One study, published in PLoS One in 2015, found that rats who ate pectin -- a type of fiber found in brown rice -- tended to eat fewer calories throughout the day and that they lost more fat than rats that didn't eat pectin. Fiber has also been shown to help weight loss in people. One study, from a 2015 issue of the Annals of Internal Medicine, found that one simple diet change -- getting 30 grams of fiber daily -- had a significant effect on weight loss. This indicates that a simple lifestyle change of eating more fiber will help you shed pounds. A serving of chicken and rice has 3.5 grams of fiber, or 12 percent of your 30-gram goal. 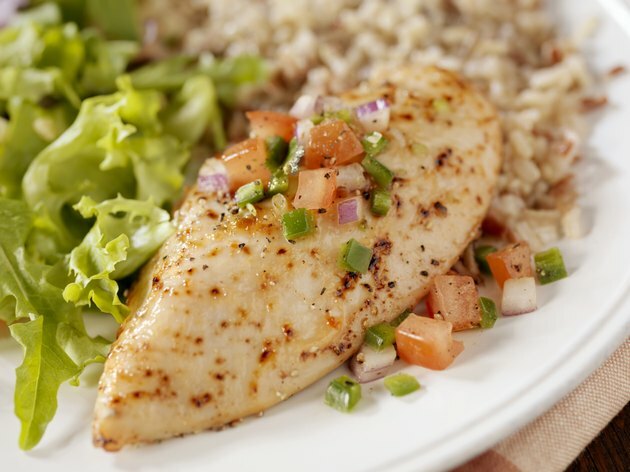 Chicken and brown rice also help you eat more protein -- another key factor in weight loss. Higher protein meals move slowly through your digestive tract, which literally keeps you full longer after your meal. Because you're not as hungry, you'll likely find it easier to maintain the lower calorie diet you'll need to follow to lose weight. Protein also provides amino acids -- the building blocks your body needs to build fat-burning muscle. Eating a higher protein diet can help improve your physique as you get close to your goal weight, too. Women and men who paired a high-protein diet with strength training improved their body composition, which is boosting muscle tissue and burning fat, better than people who followed a low-protein diet. A serving of chicken and brown rice contains 32 grams of protein, and provides all the essential amino acids you need. Sitting down to a dinner of plain chicken and brown rice each night during your weight loss journey probably doesn't sound appealing, but these diet staples don't need to be dull. Use grilled chicken breast, brown rice and your favorite veggies to make a low-fat vegetable soup, and boost the flavor with cilantro and a squeeze of lime juice. Or, make a grain bowl by topping a cup of brown rice with shredded chicken breast and chopped vegetables -- try tomatoes and cucumbers for Mediterranean flare, or grilled peppers and mushrooms for Tex-mex flavor -- plus a low-fat sauce such as lemon juice or Sriracha. Infuse your chicken with flavor by making a homemade marinade. Try a marinade made with rice-wine vinegar, green onions, low-sodium soy sauce and chili flakes. Or, for a sweeter option, try one made from apple cider vinegar, nutmeg and cinnamon.